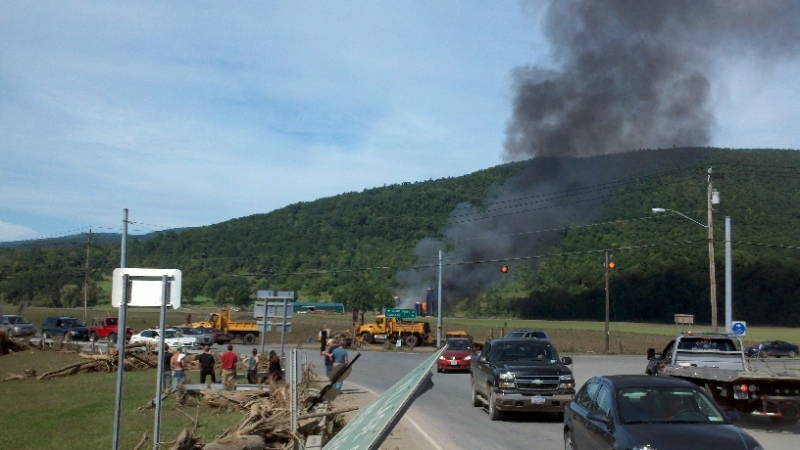 Correspondent Marty Rosen was on the ground in Schoharie County yesterday morning and early afternoon, and sent us these photos of Middleburgh, where -- to add insult to Irene's already devastating injury -- a barn fire broke out around 11am yesterday. Middleburgh, NY - Fire destroys a barn Wednesday morning on Route 30. A loud pop followed by a thick black plume of smoke drew mud-soaked store owners to the scene. Photo by Marty Rosen. MIDDLEBURGH, NY - Alex Kutinsky, 24, helped his brother carry a lifetime of ruined belongings to the curb Wednesday. 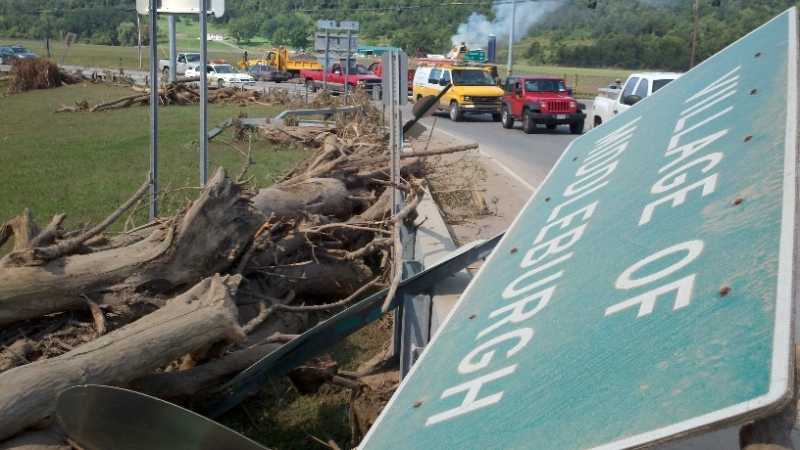 "Come to Schoharie and see what everybody lost, he said. "Nobody has a home and winter's coming." 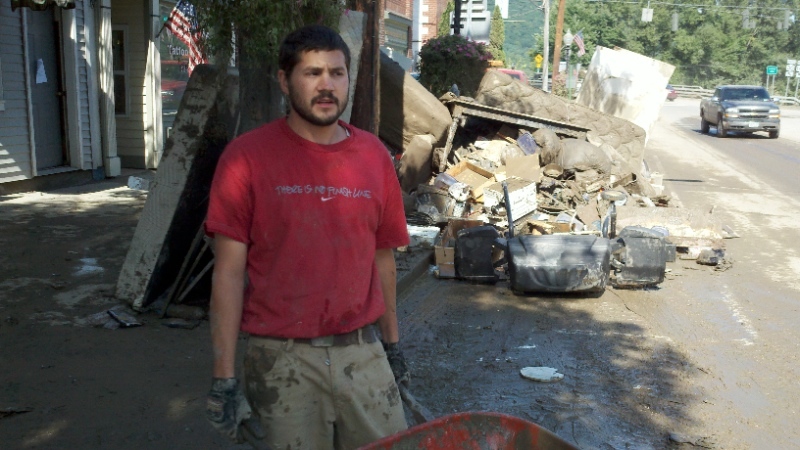 Fire crews from Buffalo and Rochester were pumping silt and muddy water from stores and homes. The sidewalks were slick with mud. Photo by Marty Rosen. MIDDLEBURGH, NY - "We lost everything," said Christine Kraemer, who works at the non-profit Everything Shop in town. Proceeds support the Schoharie Council of Senior Citizens. She worries that they won't be able to collect enough good winter clothing for the shop, which is a mainstay for already struggling residents. Photo by Marty Rosen. 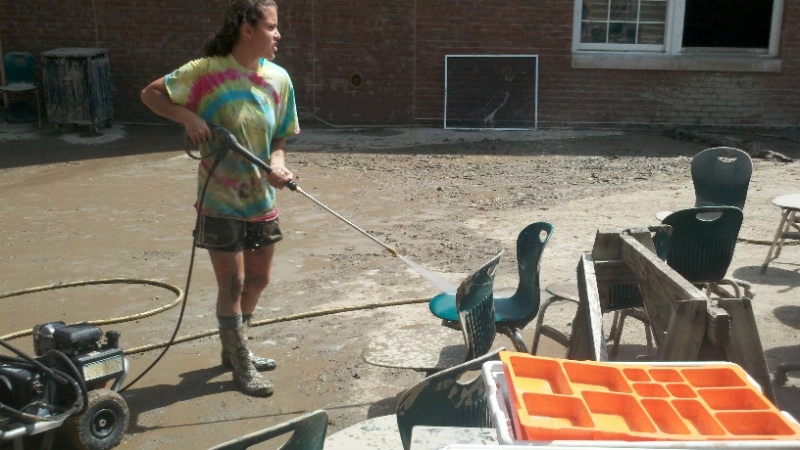 MIDDLEBURGH, NY - Kendra Wood, 16, hoses down muddy cafeteria chairs Wednesday outside Middleburgh High School. Dozens of students went to work in barn boots, mud splattering T-shirts and bare legs. "Yesterday it was just me and four other guys who work here, then all of a sudden: whoosh! They all showed up," said Mike Sherwood, who has handled mail and garbage since he graduated in 1999. Photo by Marty Rosen. MIDDLEBURGH, NY - Michele Weaver, left, Middleburgh Central School District superintendent, with student Sunny Dickerson, 13. 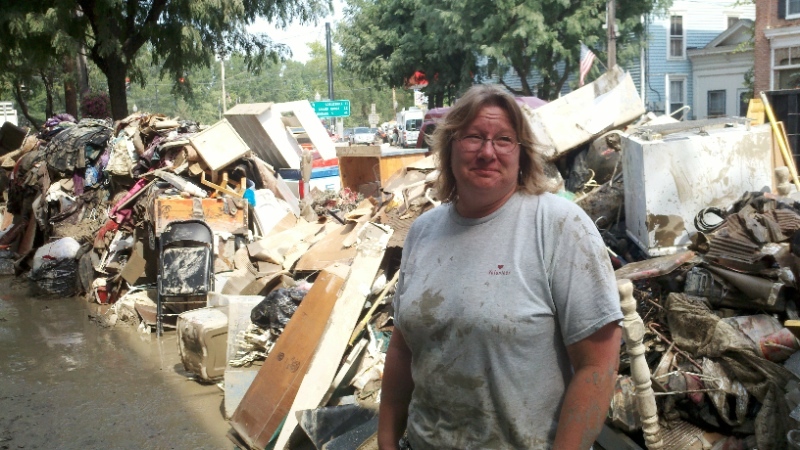 Flood waters destroyed the cafeteria, the computer lab, and a CAD facility. The new $77,000 track was also destroyed. Photo by Marty Rosen. 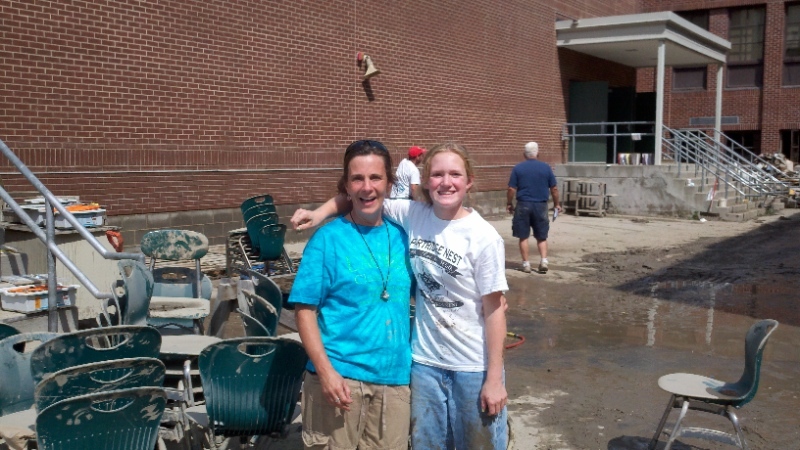 "We didn't lose anybody, we lost things," said Weaver, as students shoveled mud from classrooms. She alternated between tears and pride, describing how now homeless families came from the shelter to help. She can't say when school will open for the 900 students at the pre-K to 12 district. Brian Sherman, Schoharie Central School superintendent, said his buildings were not damaged but an opening date has not been set. The main shopping district in Middleburgh. 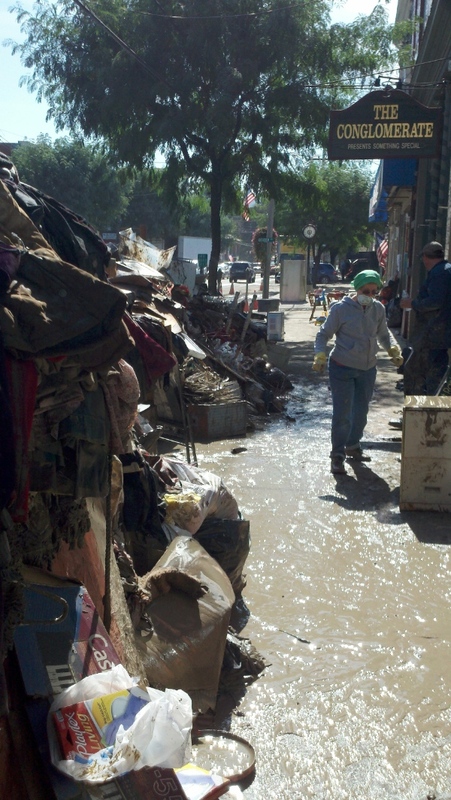 The water rose almost 6 feet high in the street-level buildings. Photo by Marty Rosen. A trailer was also moved and then crushed. NewsChannel 13 spoke with a woman who was taking a picture of it with her phone and she said her father was around when it happened. He could hear the people inside of it screaming for help. They eventually grabbed onto a telephone pole that got lose and held onto it as it traveled on the water until someone could help them.